I'll be starting the run in Boston on August 8th, 2009, and hope to reach Los Angeles by the end of the year. I'll be running or walking an average of 25 miles per day, totalling around 3,400 miles by the end of the trip. 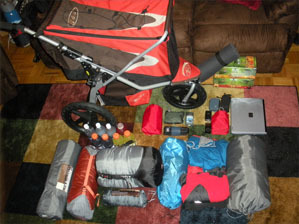 I have a modified baby stroller that I will use to push all of the gear I'll need for the trip. Clothes and shoes. Good sponsorship opportunity - I'll go through 10 pairs over the course of the run. Digital camera, video camera, and laptop to keep all of you informed of my progress. A tent and sleeping bag for those lonely nights where I don't have a host. A couple of books to read along the way, including a road atlas of course. A yoga mat. If my body cooperates, I'll do some yoga. If not, at least it can double as a matress. One or two other important things I will surely forget and have to buy the first day on the road. Though I'll be prepared to face the elements in my tent, who wouldn't prefer a home-cooked meal and a warm bed? (Or couch, or floor-I'm not picky.) If you or someone you know lives near The Route I plan on running, please Contact Me.